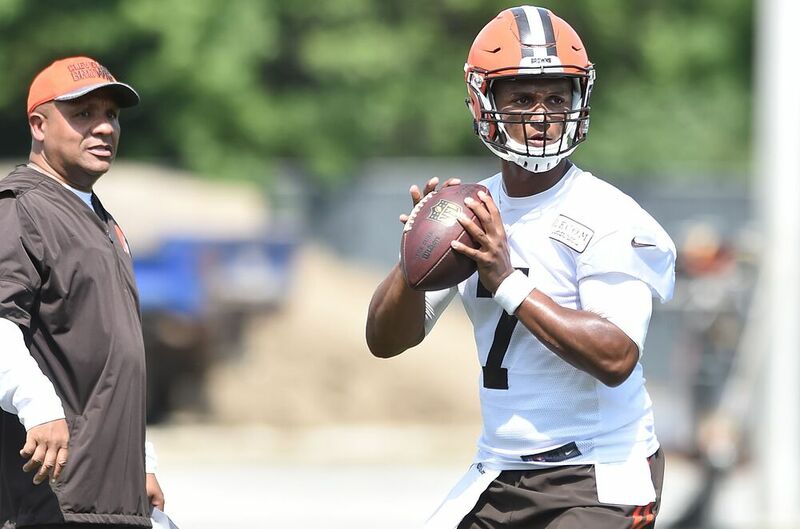 In a competition for the Cleveland Browns’ starting quarterback job, rookie DeShone Kizer is making his case to be Cleveland’s starter after a great camp. Don’t look now, but the Cleveland Browns might have interesting brewing at quarterback for them heading into training camp. Apparently 2017 second-round pick DeShone Kizer has moved the needle in the Browns’ offseason program thus far. He could end up starting in Week 1 for Cleveland this season. It is a four-man competition for the Browns’ starting quarterback gig between Kessler, Kizer, Brock Osweiler and Kevin Hogan. Hogan isn’t really in the mix despite playing some for Cleveland last fall. While Osweiler has the most starting experience of the four, he is in a new offense after a strange season with the Houston Texans in 2016 to say the least. Kessler has the most starting experience in Browns head coach Hue Jackson’s offense from 2016. Though an accurate passer, Kessler lacks the arm talent and the durability to win long-term in a northern climate division like the AFC North. Kizer had his issues with accuracy playing for Brian Kelly in Notre Dame. Leaving school two years early was a bit of a head-scratcher, but Kizer isn’t the first quarterback to leave South Bend in recent years before exhausting his collegiate eligibility. Visually, Kizer has the prototypical build to be a starting quarterback that can hold his own in the AFC North for Cleveland. He is big in stature and has a powerful right arm that can cut through harsh Rust Belt winds. It only serves the Browns to keep this four-man competition going as long as possible. Jackson realizes that he will only get a third year as head coach if he can find competency at quarterback. This has been an issue for the Browns since coming back into the league in 1999. Though Cleveland has whiffed on so many quarterbacks in the last decade plus, at least Kizer looks like a signal caller than can make the tough throws in the Browns offense. Look for he, Kessler and probably Osweiler to compete for the starting job into the final week of the preseason.